We're not a democracy. It's a terrible misunderstanding and a slander to the idea of democracy to call us that. In reality, we're a plutocracy: a government by the wealthy. I see in the near future a crisis approaching that unnerves me and causes me to tremble for the safety of my country. As a result of the war, corporations have been enthroned and an era of corruption in high places will follow, and the money power of the country will endeavour to prolong its reign by working upon the prejudices of the people until all wealth is aggregated in a few hands and the Republic is destroyed. 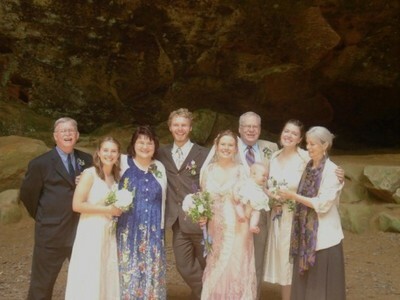 The photo, taken by Allison Zarcaro Walker last Saturday, is of the marriage of 2 families, the Carlsons and the Thomases. Today happens to be the birthday of both Adam Smith, born in Kirkcaldy, Fife, Scotland (1723), and John Maynard Keynes, born in Cambridge, England (1883). These 2 pillars of the form of economics called Capitalism are for many in the United States the real Founding Fathers of our country. Smith said that market forces serve the public good, and that government regulation, for the most part, does not. Keynes wrote a book during the Great Depression that argued governments can put people back to work by spending lots of money, even if it means running a deficit. FDR tried it. Since Reagan, certainly continuing with the Bushes, and promised renewal by McCain, our country has received its direction from corporate boardrooms more than the Congress. Somehow this seems the perfect day to reply to a very important email I received last month. It has been high in my priorities on this machine to do so, but the passion with which it was written needs to be matched by me...and that has taken some time to fuel up. The letter is from a friend and colleague at the school where we both work. I would love to identify him specifically, and maybe I will later if he gives me the high sign to do so. But I want to write this now and so I shall be vague. Besides his academic duties, this man coaches sports. Athletics is extremely important to him, almost as important as his family, living a healthy life and being as self-sufficient as possible. I've known him for 10 years, and I have to say that when it comes to my work with multi-handicapped kids I often turn to him, rather than psychologists and medical people, for an opinion on what challenges the student has to deal with. He can have a kid stand on one foot and tell me what processing is going on. So I trust him and we agree on a lot of stuff---though maybe not on whether theater or sports should get more funding. Anyway, he replied to something I sent out about the environment and climate change. He said that increasingly his work, the chores at home, the plans for the future, all pale when he looks around at what humans have done, and continue to do, to this planet. He says a change in lifestyle is what's necessary, and few people I know are more serious about it. It's amazing to see someone make that change when they set about to do it. It's a huge commitment, and it might even mean moving somewhere else. People are starting to do that. But he knows he can't do it alone, and he looks to friends and family for support and cooperation. It's not always there. Other people we both see are not doing anything apparently. Many become hostile at the mere mention of the problems we see. They don't want to hear about it. It's not a topic for social discussion in a school. He's a believer in school spirit, dedicated to and patriotic about the United States. He says, "I, too, feel a sense of 'change is a coming' and I aspire to be ahead of the curve when it comes. It is amazing to me how more people are not standing at the top of the mountain with lungs full of air ready to shout 'its time to act NOW!!!' Where is the leadership in this country? Of course we know where the lack thereof is. I think alot of people are waiting for the change in the WhiteHouse and are looking for someone of National Significance to get the ball rolling, to start making the sacrifices necessary to 'right the Ship'. I keep hope that it is not to late and that the 'American Engine' can lead the way again, but we need to shake this country to its foundation to do so, and the system seems very clogged with 'walk the liners and all will be O.K.'". The series of storms we've had this week in Southeast Ohio may be something of a wakeup call even for the most hardened among us. People compare the tornadoes to ones we've had before, but no one ever has experienced 5 hours straight of ceaseless lightning and thunder. Skies never have looked more threatening around here...and yesterday in school there was a hush and little nervous laughter when we had the tornado drill. An hour later an announcement came for students not to leave their classrooms because of what was going on outside the building. During this entire year, administrators have had to figure out new guidelines regarding "calamity days," what they are and what to do. The more conservative Americans feel that through hard work and heroic service you earn your piece of the pie. Once you have that piece you resent any interference from the "outside" that tells you change is necessary. You don't want to be told you can't throw your gum wrapper out the car window anymore, that the way you live may be bad, harmful, wrong. It goes against the grain. And yet, and yet...where did this attitude come from? What happened to the American who wants to help others? To give to a public cause and not just private charity? Was it Viet Nam that split us as a nation, totally and forever? "Things to Do in the Belly of the Whale" by Dan Albergotti from The Boatloads.© BOA Editions, Ltd., 2008. But that it's okay, though, to be cynical about the Muzak. Everyone understands why it's there. So accept that too. And as you ride up the elevator remember that everyone on that ride is trying to reach the top too. That ceiling, whatever your gender, is hard to penetrate. But someone, with the right attitude, will surely break through. That fuels a lot of ambitious true believers. Both men and women. What's more, no self respecting CEO has less than a billion dollars today. Well, if we here in the USA ever begin to commonly accept the notion that taxes are fundamentally good then we may begin to change. McCain is running on that basic Republican mantra. It’s not that he’s mimicking Bush, but that both men are Republicans, and share certain basic beliefs. Taxes, regulation, oversight, and government programs (they claim) are innately bad. Except for the military and their corporate friends. But we know all this. Oh, a quibble. Roosevelt wasn’t a Keynsian. If he had been the country may have gotten out of the Depression before WW2 proved Keynes right. FDR was actually an economic conservative but one who believed in pragmatic solutions. He never primed the pump before the war. Gary Houser is an activist, based (as opposed to "housed:" this guy sleeps wherever his backpack drops) in Athens. We're not "Harvard on the Hocking" or the Greek ideal realized in Appalachia. We're coal country. A retention pond wall collapsed early this morning at the Tennessee Valley Authority's Kingston steam plant, releasing a mixture of water and fly ash that flooded 12 homes and derailed a train. As we observe the tragedy of what may turn out to be the largest ever spill of toxic coal ash, there is something positive to celebrate this Christmas Day. Eight years ago in Martin County Kentucky, there was another dam failure and huge spill of 300 million gallons. Despite its monumental size, national media coverage never even occurred because the coal companies and local law enforcement blocked the road and kept media out. And the national environmental groups did not do enough to garner attention. This time around, the story has turned out differently. Due to a collective effort of dedicated activists all around the country, pressure was successfully mounted on the national news networks to provide adequate coverage. At a time when the coal industry is hoping to gear up its "clean coal" propaganda campaign to the Obama administration, the last thing it wanted was a huge coal tragedy on prime time on Christmas. The opening line of the NBC report describes the spill as being around 30 times the size of the Valdez oil disaster in Alaska, and there is a spokesperson for the Union of Concerned Scientists stating emphatically how this shows there is "no such thing as clean coal", that this is an "oxymoron" - like saying "safe cigarette". Publicly minded citizens will have an opportunity to push Obama's EPA to make this declaration, which would place substantial additional pressure on the coal industry. This coverage of the spill will also put "clean coal" forces on the defensive at a time when the Obama transition team is debating how much economic stimulus money to direct toward clean sources. Hopefully, Obama is watching these developments on TV while in Hawaii. Something very positive did happen "behind the scenes" during this very sad disaster. My heartfelt appreciation is extended to all who helped out !!! 28 Dec 2008 @ 09:36 by jazzolog : So Where Was The EPA All This Time? When Earthjustice Attorney Lisa Evans testified earlier this year before a congressional committee about the looming threat from coal combustion waste, she warned that the federal government's broken pledge to regulate disposal of the potentially dangerous material threatened the health and safety of communities across the country. Speaking before a June 10 hearing of the House Subcommittee on Energy and Natural Resources titled "How Should the Federal Government Address the Health and Environmental Risks of Coal Combustion Waste?," Evans pointed out that the U.S. Environmental Protection Agency said in its Regulatory Determination on Wastes from the Combustion of Fossil Fuels published in 2000 that federal standards for disposal of coal combustion waste were needed to protect public health and the environment. The federal failure to regulate the waste has put 23 states -- including Tennessee -- in a special bind, since their statutes have "no more stringent" provisions prohibiting them from enacting standards stricter than those found in federal law. Without federal action, those states can't regulate coal combustion waste disposal beyond the few obviously inadequate safeguards that now exist. "EPA and [the federal Office of Surface Mining] are fiddling while ash from burning coal poisons our water and sickens our communities. Inadequate state laws offer scant protection. Federal environmental statutes dictate that EPA and OSM must do what they promised to do and what they have been directed to do -- promulgate enforceable minimum federal standards to protect health and the environment nationwide from the risks posed by mismanagement of coal combustion waste." Evans' testimony seems almost eerily prescient now in the wake of the disaster that befell an Eastern Tennessee community this week following the collapse of a lagoon holding coal combustion waste from the Tennessee Valley Authority's Kingston power plant. The resulting deluge inundated 12 nearby homes, buried more than half a square mile in four to six feet of hazardous waste, and blocked a tributary of the Tennessee River, which provides drinking water for millions of people downstream. TVA, a federally-owned independent corporation, initially estimated the amount of coal sludge released at 1.7 million cubic yards. But after completing an aerial survey of the inundated area, it revised its estimate upward to 5.4 million cubic yards. That's more than 1 billion gallons of waste containing potentially dangerous levels of heavy metals including arsenic, cadmium, mercury and lead, as well as radioactive elements such as uranium and thorium -- impurities typically found in coal. While the company is downplaying the hazardous nature of the material, telling the New York Times that it's "inert" and "not toxic or anything," an assessment by the Environmental Protection Agency found that the risk of getting cancer from coal ash lagoons is 10,000 times greater than safety standards allow. The Southern Alliance for Clean Energy is warning people to avoid bodily contact with the ash -- and calling on government authorities to provide the public with more information on the potential hazards. "There are multiple pathways in which people can become potentially affected by these heavy metals, including bodily contact, drinking water, air pathways and aquatic wildlife and fish," says SACE Executive Director Dr. Stephen A. Smith, "and we feel that appropriate warnings should be expressed to ensure the safety of Tennessee residents." In recent years, the technology for capturing the pollutants from stacks of coal-fired power plants has become more sophisticated, which means coal combustion waste contains even higher concentrations of toxins. But as the Tennessee disaster shows, neither power companies' methods of disposing of this dangerous waste nor government regulations governing the disposal methods have advanced much. With regulators' blessing, TVA was simply putting ash from its massive Kingston plant -- where nine burners consume 14,000 tons of coal a day -- into a nearby lagoon where it was mixed with water, allowed to settle and then pumped into what's known as a dredge cell. The company reports that the ash level in the dredge cell at the time of the collapse was unusually high: 55 feet above the water level in the nearby ash pond, with a spokesperson describing the level as "a lot higher than any other internal dredge cell that we have in TVA." The collapse of the earthen wall holding back the coal sludge came following days of heavy rain. But this was no natural disaster: The company and regulators already knew the structure was prone to failure, with official inspection reports showing at least two other breaches of the same ash lagoon in the past six years. Because of the toxins in the coal ash sludge, there are now serious concerns about the spill's environmental and public health impacts. TVA says its own preliminary tests indicate there's no danger to water quality in the nearby Tennessee River, though the environmental group United Mountain Defense reports that people living near the plant -- many of whom rely on private wells -- have experienced prolonged vomiting after drinking their water. * documented infertility and other abnormalities in nearly 25 species of amphibians and reptiles inhabiting coal combustion waste-contaminated wetlands in South Carolina. Evans also noted more recent news reports of coal combustion waste contamination discovered in Maryland, Indiana and Montana. And when developers used 1.5 million tons of coal ash to build a golf course over a shallow aquifer in Chesapeake, Va., nearby wells almost immediately began showing elevated boron levels -- a marker for coal combustion waste contamination. Given the clear danger that poorly regulated coal combustion waste presents to the public, it's time for the federal government to take action to prevent another disaster like the one now facing Eastern Tennessee. Next time you flip that light switch or turn on your computer, give a thought to and have a care for where that electricity comes from and what people who live in coal country have to go through for you. Hyperlinks are sprinkled through Sue's article, and these photos are from the TVA aerial video of the site, which I guess you can watch on YouTube. The 60-day notice was filed today. Knoxville, Tenn.: A coalition of local residents and environmental groups has put the Tennessee Valley Authority (TVA) on notice today for its negligence surrounding the tragic December 22 coal ash spill at the Kingston Fossil Plant in Roane County , Tennessee . In collaboration with dozens of neighbors whose property was directly affected by the spill, the groups Appalachian Center for the Economy and the Environment, Earthjustice, Public Justice, and Sierra Club are requesting that a federal court oversee the cleanup and remediation and that the responsible parties compensate local residents. On December 22, 2008, an earthen dam for a coal ash waste impoundment failed at the Kingston Fossil Plant, releasing hundreds of millions of gallons of coal ash sludge and contaminated water into the Emory and Clinch Rivers and onto more than 300 acres of nearby land. Most of this potentially toxic waste remains in or near those waters. The spill left behind piles of coal ash waste that will continue to leach and channel toxic chemicals into those two rivers and other groundwater whenever it rains. Environmental Protection Agency (EPA) testing found more than 100 times the maximum Arsenic level allowed by the federal government in the Emory River near the spill site. The metals in this coal ash sludge may also become airborne as particulates when the ash dries out. The Tennessee River is the source of drinking water for the City of Kingston, Tennessee, and the Watts Bar Reservoir downstream is used by several communities for their drinking water supply. This poses a substantial health risk to persons who cons ume contaminated water, eat contaminated fish, or breathe airborne dust. The groups sent the TVA a formal notice of intent to sue today. The Sierra Club is represented by Joe Lovett with the Appalachian Center for the Economy and the Environment, Jim Hecker with Public Justice, Lisa Evans and Deborah Goldberg at the nonprofit environmental law firm Earthjustice. Mary Parker at Parker & Crofford represents the local residents. The Sierra Club's National Coal Campaign is working to ensure coal is mined responsibly, burned cleanly and does not contribute to global warming. This involves addressing the entire coal cycle, including mountaintop removal mining and its devastating impact on communities. Sierra Club supports efforts to invest in clean energy solutions. This coal ash spill is a painful reminder that there is no such thing as “clean coal.” For more information, visit www.sierraclub.org/coal. My take on this: I suppose, since Obama campaigned for "clean coal," it's not premature to slap a suit on him about this issue. Maybe Bush and his cronies, as they pack their bags, could be convinced to leave a little cash in the Treasury to pay off the thousands of lawsuits pending against his government. MSNBC is carrying an Associated Press story that says, "The nation's largest government-run utility ignored two small leaks that could have provided a warning years before a coal ash pond collapsed, flooding a neighborhood with a billion gallons of sludge, a former federal regulator contends." http://www.msnbc.msn.com/id/28526041/ And take a look at the photos. Also McClatchey has this to report on the topic: "The coal ash spill in Tennessee last month is putting a spotlight on whether the ash from 450 other power plants around the country could be contaminating the nation's drinking water supplies.... The EPA in 2000 decided that coal ash wasn't hazardous waste and left regulation up to the states. Now, however, environmental activists say the Tennessee spill shows the need for federal standards for how coal waste is handled at the coal-fired power plants around the nation." http://www.mcclatchydc.com/260/story/59116.html Maybe the EPA should be cited in the suit too. the nineteenth century and enter the twenty first? Though I see, listening briefly to NPR this morning, the American Enterprise Institute (home base for Neocons if you're not familiar with this "think tank") is already complaining about the "waste of money" if the government invests in green. I suppose this may have nothing to do with their corporate and business interests, would it?